The Honourable Michael Gravelle, Minister of Northern Development and Mines, and Jennifer Jonas, one of the producers of the film Born To Be Blue, made introductory remarks at a public screening of the film on October 14 at the Thunder Bay Community Auditorium. Minister Gravelle summarized the Ontario Government’s investment in the film industry in Northern Ontario. Through the government’s Northern Ontario Heritage Fund Corporation, the growth of the film industry in the north has been supported by an investment of $69 million to 127 projects. Thirteen million of that was invested in the 2015-2016 fiscal year. 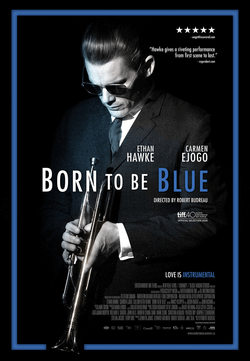 Northern-produced films that received this support included Born to be Blue (shot in Sudbury), Mean Dreams (shot in Sault Ste. Marie), Sleeping Giant (made here in Thunder Bay) and The Days Of Destitute—another local movie which has completed principal filming and is now in post production (the second feature film by Imaginarium Studios). The government estimates their financial investment in the northern film industry has resulted in more than $309 million of direct economic activity. Following the screening of Born to be Blue, Minister Gravelle and Jonas answered questions. When Jonas was asked about her plans to produce a film in Thunder Bay, she replied that she had been given a tour of the city and close environs while here for the screening and believes that the city is a very viable location to make films. “All I need are the scripts,” she concluded. When asked if government funding was secure in forthcoming budgets and whether local filmmakers should count on this source of funding to continue, Minister Gravelle responded that the Northern Ontario Heritage Fund Corporation has existed for four years now and he doesn’t see any changes in terms of the budget. Attendance at the screening was sparse with about one third of the orchestra seats filled. The film was received enthusiastically and there was warm applause both for the screening and Jonas and Minister Gravelle.